There's always a pretty great feeling when you get to remove a long time item off of your wants list. It's even better when you get to remove one of the big ones. This Doo Rag LP was a top 5 item on my list and it's just wonderful to finally have this record in the collection. I've had the CD version of this forever. I even have the wacky limited CD version that comes in a box and has a gigantic Doo Rag patch, but the vinyl version had always eluded me. Sure, I paid a healthy amount for this one, but I have seen it sell for substantially more in the past. The price was right to finally take the plunge. 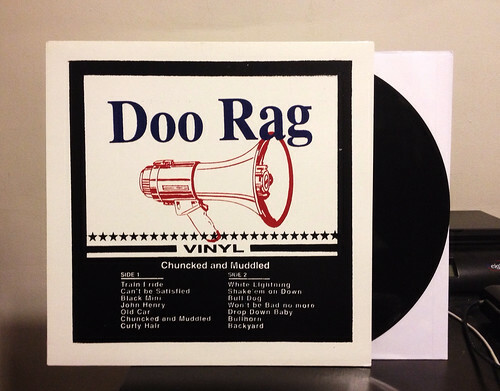 For the uninitiated, Doo Rag was one of the wackiest bands to kick around during the mid 90's. They played with Beck, the played with Ween, frankly they played with an awful lot of great bands. The drummer, Thermos Malling didn't play a drum set, rather he banged on cardboard boxes and garbage can lids. The singer & guitarist was Bob Log III, a man with a wicked slide guitar and some pretty unusual methods for distorting his vocals. Though I never thought Chuncked And Muddled was as amazing as the band's 2nd album, What We Do, this album still has some great songs. If anything, where the band really made strides between this album and What We Do was in the production department as Chuncked And Muddle does sound a bit thin and tinny. Still, it's a great record and one that I couldn't be more excited about finally owning.